Alex Maloney with Molly Meech (NZL) gave up their lead after today’s first race, but then stormed back in the second and third race to retake the lead and now sit 12 points ahead of the rest heading into the medal race. Charlotte Dobson with Saskia Tikey (GBR) rode yesterdays wave and pulled into first overall before slipping a bit back in races two and three. They now sit tied with the 2016 Gold medalists, Martine Grael with Kahena Kunze (BRA), for second, but remain in striking distance of the leaders with just the single race remaining. 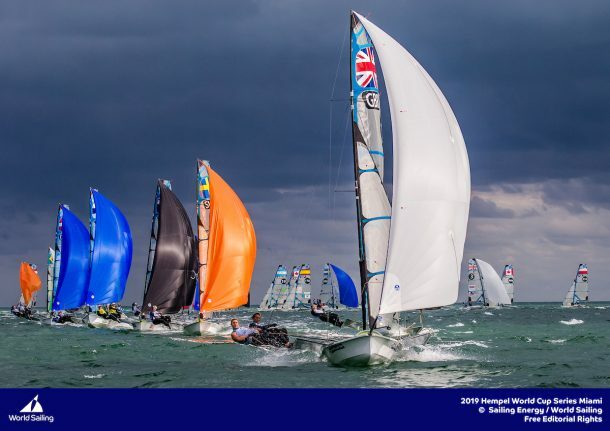 Erik Heil and Thomas Ploessel (GER) had their worst result of the regatta in the second of three races in the 49er class. But they won the other two and will carry an 11.7-point lead into the Medal Race. They are guaranteed at least a silver medal, Dylan Fletcher-Scott and Stuart Bithell (GBR) are second while countrymen James Peters and Fynn Sterritt (GBR) are third. 49er, 49erFX, Nacra 17 and the RS:X windsurfer Medal Races will be live across World Sailing’s YouTube and Facebook from 12:00 local time on Saturday 2 February.